Ah, America's real favorite past-time, the video game. You would think that being in the business of making games, your online presence would overflow with interactive goodness. But that's not really the case for the majority of video game sites. 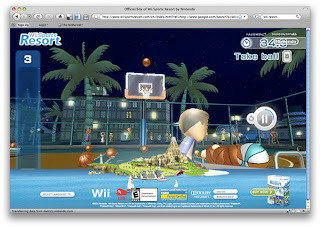 Nintendo has been really smart however with the Wii online. Everything is about showing you how much fun it is to play. 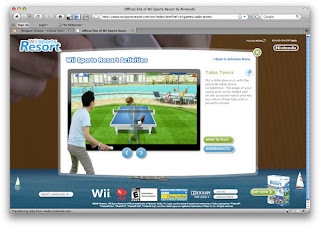 The new Sports Resort site does simply that with full-screen video of a family playing all the activities in the game. There is a whiney part of me that wants to click around, but it's also the part of me that stares with it's mouth open at pretty objects so they've canceled each other out. Each activity has a demo video and a person playing it. And that's it. I tried to find more, I really did. I tried to take control of the guy playing the game, and tried to play him playing the game. No go. I'll see what else we've got out there..